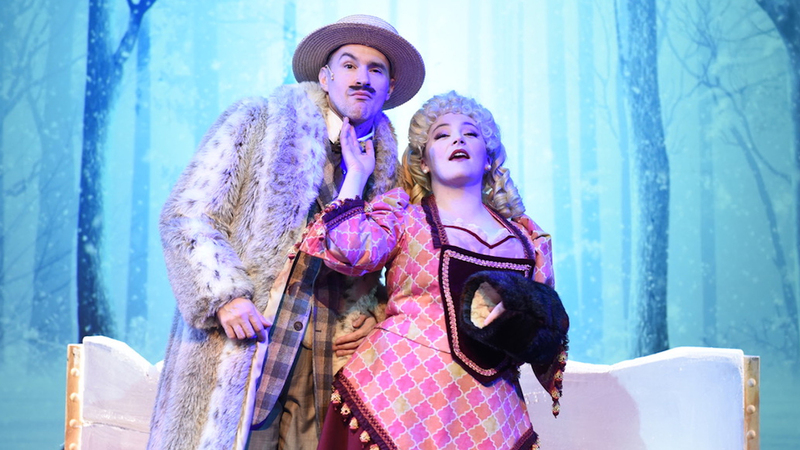 Not even the force of a polar vortex could deter the performers and audience as Porchlight Music Theatre opened its altogether bravura production of “A Gentleman’s Guide to Love & Murder” this week. And maybe that’s simply because this brilliantly conceived and equally brilliantly performed show was meant to defy the odds on every count. Not surprisingly, this musical, with its sparkling, satirical, immensely clever lyrics by Robert L. Freedman and Steven Lutvak, and its zesty, neo-operetta-style music by Lutvak, has rarely been revived since it received the Tony Award for Best Musical in 2014. And as you watch the wildly gifted, Broadway-level Porchlight cast – ingeniously directed and choreographed by Stephen Schellhardt, in collaboration with Aubrey Adams – you can quickly understand why. Not only does it require an ensemble of the most exceptional actor-singers who possess a flair for high-styled, mock-British comedy. But it also demands the gifts of a comedian of singular physical and verbal genius. And in Matt Crowle – who by every measure should be a Broadway star – this production has its man. In fact, it has seven men and two women, (nearly) all of whom meet untimely deaths, and all are portrayed to laughter-inducing, phenomenally dexterous effect by this one seemingly exhaustion-proof actor. Clearly, some explanation is needed at this point, although anyone familiar with “Kind Hearts and Coronets,” the classic 1949 film starring Alex Guinness in the roles played here by Crowle, will know the conceit driving the story – an Edwardian-era tale of love and murder, to be sure, but also a look at fate, legacy and that enduring staple of British life: social class. It all begins as Monty Navarro (Andres Enriquez, whose lush tenor and savvy acting in this role is bound to catapult his career) is seen sitting at a desk in his prison cell, and penning his memoir shortly before he is to be executed for committing murder. That memoir is then brought to vivid life. In the wake of the death of his mother, Monty, a young man with limited prospects, learns that he is, in fact, the son of an aristocratic woman who was disinherited by her noble family, the D’Ysquiths, when she married a scoundrel of Castilian birth. Monty, who is obsessed with the shrewdly seductive, status-seeking Sibella (the ideally fetching and wily Emily Goldberg), decides to reach out to Lord Asquith D’Ysquith, (Crowle), the wealthy banker and scion of his mother’s family. But his quest for some recognition, and a job, is bluntly dismissed. And during a touristic visit to the D’Ysquiths’ ancestral home, Highhurst Castle, he is further dissed by the Lord Adalbart (Crowle), whose angry rant, “I Don’t Understand the Poor,” could easily become the anthem of this moment. A further attempt at some kind of recognition comes with Monty’s encounter with an alcoholic clergyman who is part of the family (Crowle, once again), and it is that man’s “accidental” departure from the world that suddenly sets Monty on his path to succession. Before long, in quite rapid order, one after another of the eight D’Ysquiths in line to become an Earl meet their maker, and Monty miraculously achieves his goal. Along the way, there are deadly ice-skating accidents and bee stings, charity escapades into Third World British colonies, heart attacks, weight-lifting mishaps and poisonings. And Crowle plays all the victims to zany perfection, with characterizations that shift as quickly as the necessary split-second costume and wig changes. And that is by no means all. For you certainly wouldn’t want to miss the hilarious climactic dinner party scene during which the gun-loving Lord Adelbert and his fiery wife, Eugenia (Sharriese Hamilton in a knockout turn), go at it with no holds barred. So much for love and marriage. Throughout, the voices and larger-than-life personalities of the ensemble (including Caron Buinis, Rachel Klippel, Ryan Dooley, William Dwyer, Megan Elk and Michael Reyes), lend vibrant life to the story. And conductor/pianist Andra Velis Simon’s exceptional music direction can be sensed at every turn, both in the clarity of the singers and the superb work of her band (Justin Amolsch, Yulia Block, Mike Matlock, Kedgrick Pullums, Jr., Elena Spiegel and Kelsey Vandervall), and with impeccable sound design by Robert Hornbostel. To top it all off there are Jeff Hendry’s dozens of elaborate, character-defining costumes, and the invariably clever set design of Angela Weber Miller (lit by Denise Karczewski and ingeniously enhanced by Anthony Churchill’s projection work). All of it is award-worthy. “A Gentleman’s Guide” arrives on the heels of Porchlight’s unforgettable production of “Gypsy,” and only confirms that the company is on a powerful roll at the moment. Next up? “A Chorus Line.” So just start counting “a five, six, seven, eight.” And don’t miss its “Lost Musicals” concert series – a look at Cole Porter’s “Can-Can” on March 6 and 7. Porchlight Music Theatre’s production of “A Gentleman’s Guide to Love & Murder” runs through March 16 at the Ruth Page Arts Center, 1016 N. Dearborn St. For tickets ($39-$66) call (773) 777-9874 or visit porchlightmusictheatre.org. Running time is two hours and 15 minutes with one intermission.